A quirky, non-linear memoir about the author's unconventional upbringing in and around what was then her parents' old-fashioned corner grocery store/restaurant in Greenwich Village. Arbitrary Stupid Goal is an ode to unconventionality and an elegy to Greenwich Village in the 1970s and '80s, which was crime-riddled but also 'a very tolerant place' ... Shopsin's portraits of her inimitable, larger-than-life father, Ken, and his dear friend, Willy, form the heart of this book. Willy was a fixture at The Store, an honorary granddad, mixed-race womanizer, con artist, and nightclub singer with 'a deep voice made for singing "Old Man River"... like Paul Robeson's, only softer. 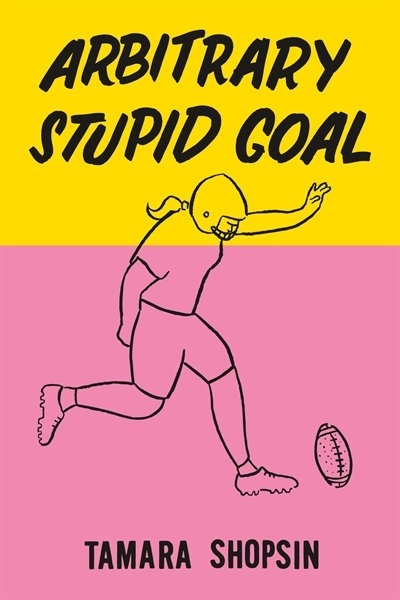 But just as powerful and sad' ... Shopsin has written a loose narrative whose half-blank pages meander through some of the things that have given her life joy and meaning...Rest assured that Arbitrary Stupid Goal is actually neither arbitrary nor stupid. Shopsin weaves a marvelous patchwork quilt of stories about a Manhattan that doesn't exist anymore ... Her narrative reads like prose poetry with the rhythm of a jazz song: much of each page is left blank, as if to emphasize the words she doesn't use; the arrangement of her spare, blunt paragraphs conjures vivid pictures throughout ... The seemingly disparate tales come together into an artistic ode to a way of life that people now living in New York City might never experience. This is a book of fleeting anecdotes told in short paragraphs. Often, Shopsin stops writing halfway down the page. Her approach prevents Shopsin from developing much momentum, a problem that’s accentuated by her narrative detours … Though her writing about Willy is sometimes moving, Shopsin’s appraisal of the neighborhood’s transformation doesn’t go very deep. Meanwhile, it’s hard to understand her decision to include periodic accounts of unremarkable journeys she’s taken in the U.S. and Europe. There are single-sentence paragraphs throughout the book, but in these sections they can be exasperatingly twee … The book’s capriciousness makes a little more sense when, at the very end, Shopsin explains her title. What did you think of Arbitrary Stupid Goal?